My studio on Vinalhaven built to my specifications in 1991, is a separate building in my backyard. It has wonderful natural light from an array of eight north facing skylights, a 22 foot ceiling in the main area, and is divided into four distinct spaces for specific drawing/painting related activities and storage. This is my third and best studio in 50 years of painting. 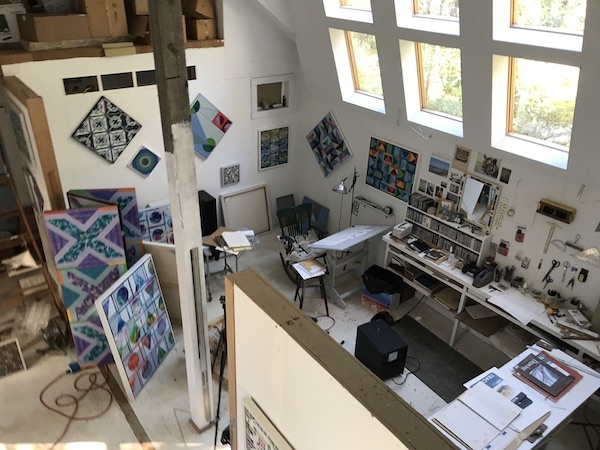 The other two studios were in Provincetown and Somerville, Mass. 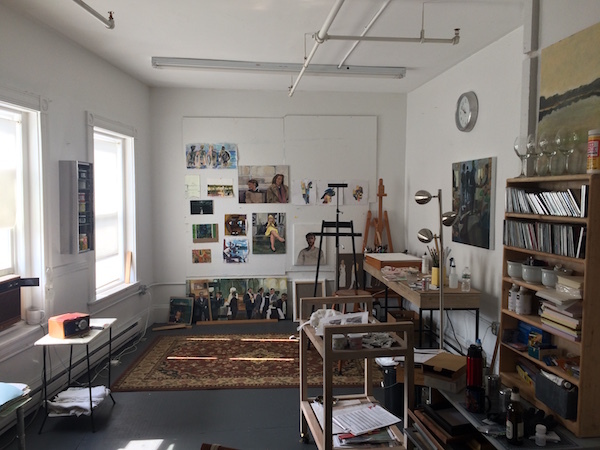 This is my studio at Humphreys Street Studios in Dorchester, Massachusetts. I also plan to set up a seasonal studio in my barn in Owls Head. The Dorchester studio is large enough for me to have a couch and nearly everyone who visits me asks if I take naps there – I don’t but find it interesting so many people ask about that. (Guess people are tired, nowadays.) I try to spend 15 – 20 hours a week in the studio. Most of my artwork is fairly realistic and urban, but I’ve recently begun making abstract collages of painted paper, which I think are inspired by Maine, or at least some idea I have of Maine. As someone who’s lived in or around Boston almost my entire life, I’m looking forward to seeing what new directions my work will take in the Owls Head studio. 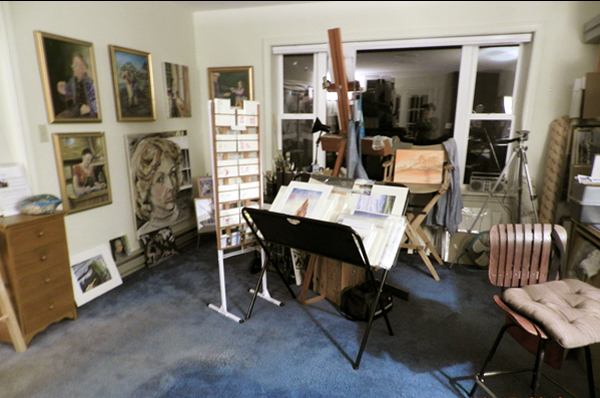 Orise Studio/Gallery, my haven to paint, write, create—get “in the zone.” As the previous owner’s family-room, it was dark and spilled into the kitchen. Hubby installed a picture window, then I built a wall, isolating the room for my studio. Having zero storage, the next year, I built shelving for my finished paintings. Two years later I constructed a free-standing wall, 6′ x 8′ x 2′ deep, to hang art and store material inside. That diminished the studio floor space. This summer I wish to add an old butcher block work bench to do wood cuts and to support a cast iron printer. Consequently, I must create space. Stuff not detrimental to my studio needs have to go to a place called, Elsewhere. Not to worry, I’ll figure it out. Once I get “in the zone.” Come visit. 312 North Shore Drive, Owls Head, ME. Open by appointment or perchance, May to November.